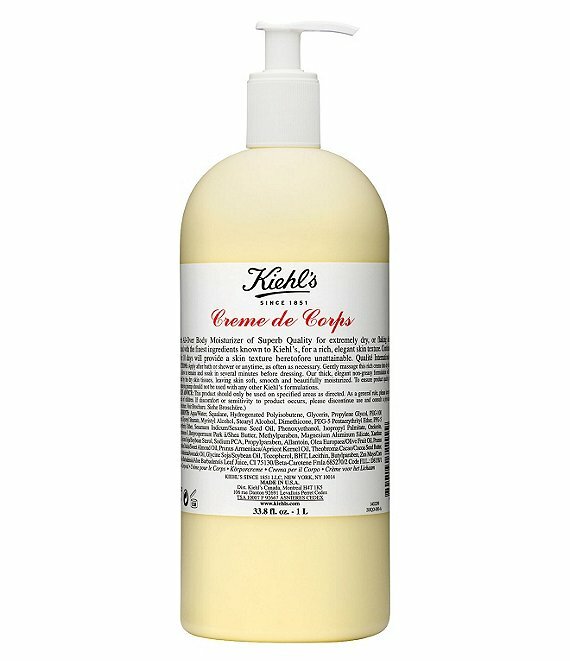 Kiehl's Creme de Corps is a superb allover body moisturizer ideal for extremely dry or flaking skin. It's enriched with the finest ingredients known to Kiehl's to give you a rich, elegant skin texture and leaves skin soft, smooth and beautifully moisturized. Winner of Glamour magazine's '2019 Beauty Award' for Best Body Lotion. Apply after bath or shower and allow to dry before dressing. And dont forget to try Kiehl's Creme de Corps Soy Milk & Honey Body Polish which gently exfoliates and nurtures skin to deliver optimal hydration. Beta-Carotene - is a naturally derived antioxidant predominantly found in many orange/red vegetables such as carrots. It is used in Vitamin A production and gives an orange tint when used in skin care products. Cocoa Butter - is a yellowy lipid expressed from the roasted seeds of the cocoa plant. It is solid at room temperature but melts at body temperature. It softens and lubricates skin and is used in a variety of skin care formulations. Sesame Oil - a refined moisturizing oil derived from Sesame Seeds, has the same emollient properties as other nut and vegetable oils and is commonly used as a carrier oil for skin care products. Absorbs easily and softens the skin.